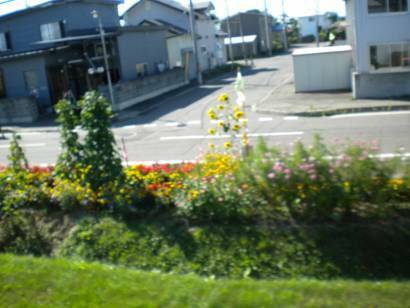 Let me start by saying it's very difficult to take a good photo from a moving train. 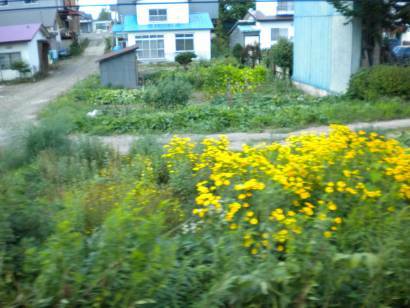 Some of these are blurry, but I'm sharing them because I loved seeing these little gardens as we rolled through cities, towns, villages, and hamlets. I was particularly struck by the fact that, as always, no space goes unused. Right next to the tracks often were gardens full of scarlet runner beans, zucchini, squash, tomatoes, eggplants, shiso, and heaps of cosmos, sunflowers, and petunias to name only a few. 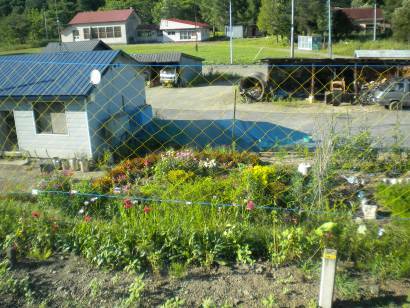 I was reminded a bit of the colorful patchwork of tiny backyard gardens I saw in London years ago from the train. These gardens, though, occurred in even the remotest of areas where it would seem there should be plenty of space elsewhere. For more regular updates on our recent Hokkaido adventure, check out my Twitter page. I love train travel; you see so much more from a train. Your photos gave us a short peek into a very different culture from a different angle. It must have been a very scenic ride. Thank you, again, for sharing. I couldn't agree more. One of the things we really love about living in Japan is the ability to travel by train. Thanks for reading!